This is obviously an old photo, but I don't remember seeing it before. 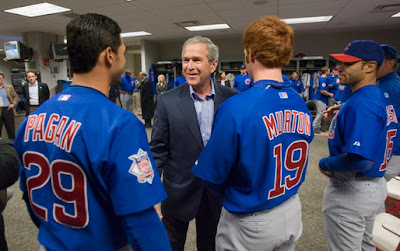 It's been a sad day in Cubdom, with the passing of legendary good friend, Ron Santo. I think Ron would want us to try to find something, somewhere, to distract us from the feelings of loss that Cub fans share this evening. So, who's the smartest guy in the image? I'm betting it's Matt Murton or Angel Pagan. Who's the most fun guy in this image? I'm betting that is Dubya. Keep in mind, it looks like Dusty Baker is the guy in the back of the room directly next to Angel Pagan's chin. Maybe the guy talking to Dusty is really smart. We'll never forget you, Ronnie. Please send our best to Harry, until we meet again.